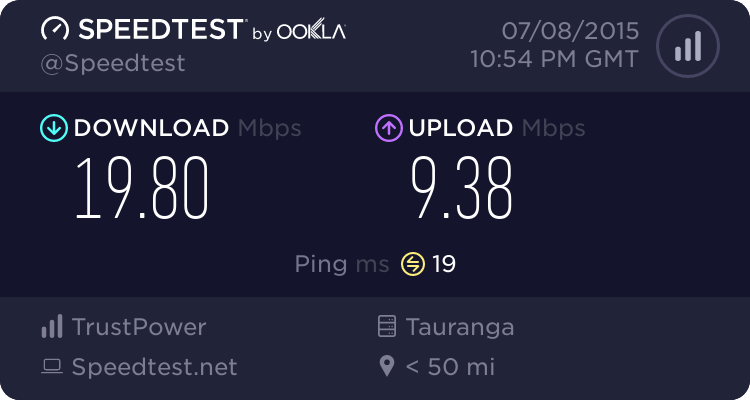 Is the below speed about right for VDSL? Chorus guy installed a splitter on one of the telephone ports that is used but not another one. would this affect the speed? also you should be using the jack point the tech installed it on, and nothing else except the modem should be plugged into it. How do i get these stats? Jase2985: what device do you have? So your first test was via WiFi? if so there is nothing wrong with your connection. You will need to log on to your router's web interface and go to the DSL section - it will show the line sync speed (which is how fast the connection is between your router and the cabinet it connects to). sbiddle: So your first test was via WiFi? if so there is nothing wrong with your connection. how can i log into the routers interface or are they all different? when i said what device do you have i mean what router do you have. type your routers IP address into your web broswer, log in with the user name and password. Jase2985: when i said what device do you have i mean what router do you have. Does that seem reasonable speed? no way to increase your speed, its a best effort service and thats probably the best you will get. What speed are you expecting over copper?